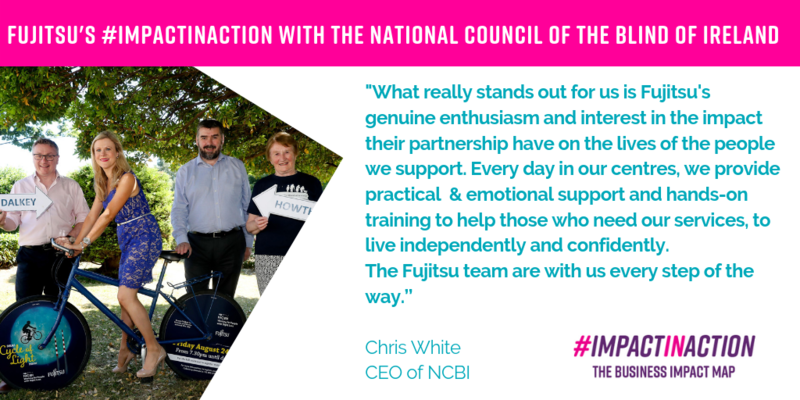 In April 2017, Fujitsu Ireland announced a two-year partnership with the National Council of the Blind of Ireland (NCBI). NCBI is at the forefront of Irish Charities working for the rising number of people nationwide who are affected by sight loss. In Ireland, working age people with sight loss face extraordinarily high unemployment rates. Working with NCBI, we have developed and delivered CV and Interview Skills Workshops.Our main aim is to build confidence in service users by providing them with the skills needed to progress beyond the interview stage into internships and meaningful employment. With the long-term goal of tackling high unemployment rates amongst working age people with sight loss, we have linked NCBI up with one of our larger training supplier, SureSkills Training, to carry out free skills workshops after our partnership’s cessation. Fundraising is another important element of our partnership. To date, we have delivered a wide range of fundraising activities which has allowed us to hit our target goal of €10,000 each year for NCBI. Together with NCBI, we feel we have more to explore in this relationship. With this, we have decided to extend our partnership for a further year with a strong focus on the development of a technical project to benefit NCBI service users. All that we have achieved is a testament to the hard work, dedication and generosity of our employees who share in our commitment to create a more positive, safer and prosperous society. This partnership supports UN Sustainable Development Goal 10: Reduced Inequalities, Target 10.2 and Goal 4: Quality Education, Target 4.5.